I have to tell you today I had the worse commute ever. I travel 25 miles everyday at 5:15am to go to work. This morning they had the freeway down to one lane and it is was just horrible. It took me over an hour to get to work. Just as I was getting ready to finally move then I noticed something move from the corner of my eye. It was a black spider about the size of a quarter on my window, you know the driver’s side window. I panicked! What do I do? What do I do? It was dark out so I couldn’t tell if it was inside or outside the window. So what do I do? Open the window like an idiot to see if I could tell if was inside the car or not. It fell!! Ahhhhhh!!! I don’t know where it fell too! Did it fall outside or is it free somewhere in my car? I grabbed every napkin I had in my car and kept it on my lap. I drove with my right hand and kept my left had far away from the window. I kept bouncing my leg so it wouldn’t crawl on it. I was freaked!!! Really freaked!! I had that creepy crawly feeling, like it was on me. I don’t even know what kind of spider it was, all I know is it was black and the size of a monster!! As soon as I got to work, I opened my door and I couldn’t find it!! I still don’t know if it is free in my car. What if it decided to have babies? Agh!!! Has this ever happened to you? Would you pull over to find it or cross your fingers it doesn’t touch you. It was scary!!! Eck!!! I knew I couldn’t just serve these to my Husband for dinner, especially since he wasn’t so keen on ground chicken. I swear that man won’t try anything new. He’s so old school. So whats a woman to do? Eat them all herself? Well, I probably could do that or make my Husband a meal that I know he would love. So, I made him a sandwich that any man couldn’t resist! I took 5, maybe 6 meatballs and poured Trader Joe’s 3 Cheese Pasta Sauce over them and topped it with pepper jack cheese on a french roll, placed it in the oven until the cheese was melted. I served it to him all wrapped up in foil. He opened it and his eyes lite up!!! For me, I went light since I ate a fat sandwich for lunch, so all I did was take 3 meatballs and poured some pasta sauce over the top. Oh man did it taste good!! The three cheese sauce really complimented the Buffalo Chicken Meatball!!! 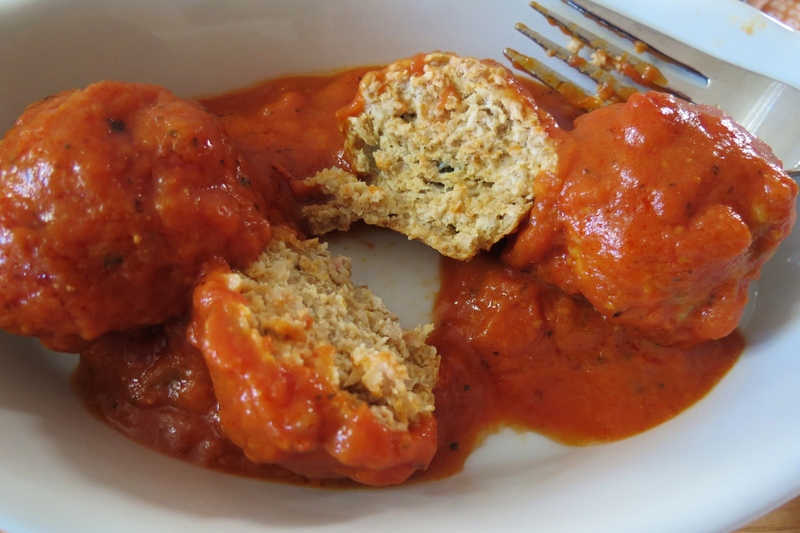 These meatballs really exceeded my expectations! I can’t get over how good they are!!! These would be perfect for serving as an appetizer with a side of blue cheese dressing, hot sauce or pasta sauce. You could also top it on pasta, pizza, make a sub, or even break them up and place them on a salad. 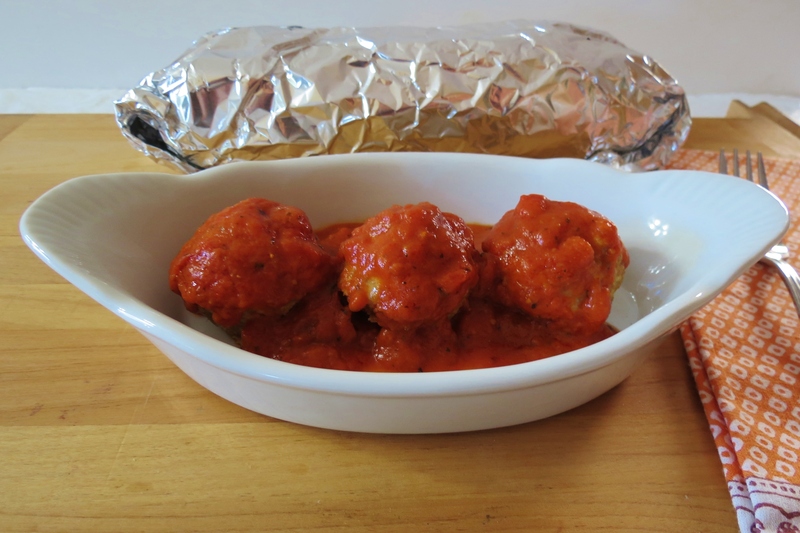 The possibilities are endless with these meatballs. 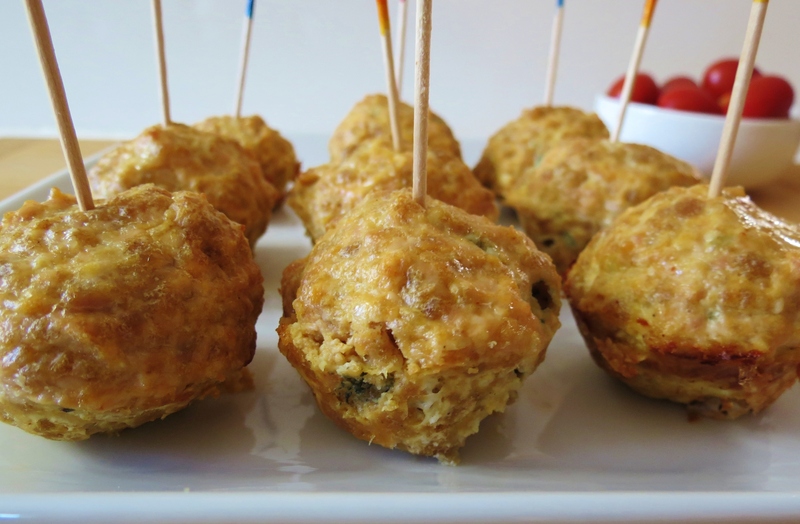 If you like Buffalo Wings you will like these meatballs!! Best part is, no bones! These are super easy to make! I took 1 pound ground chicken, 1/4 cup of Franks Wing Sauce, 1/2 cup whole wheat panko breadcrumbs and an egg. Mix it all together and rolled into meatballs. Actually the mixture is kind of wet, so I kind of juggled them from hand to hand to shape them. I placed 1.5 oz. 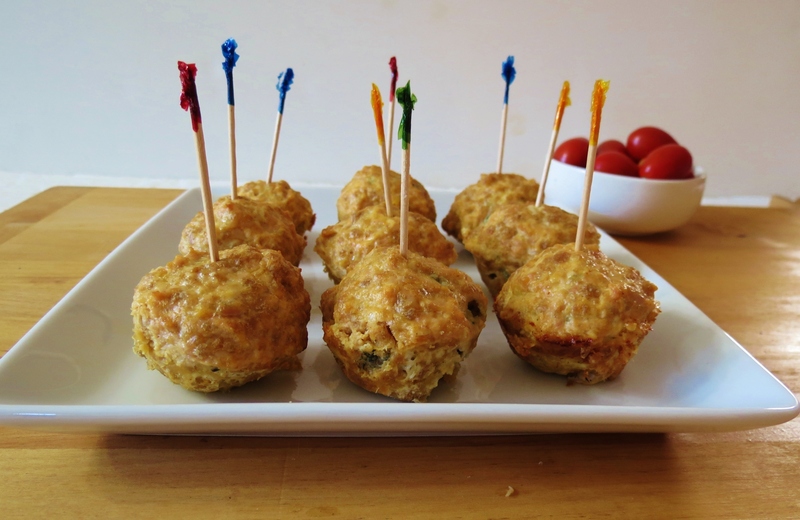 of meat into a mini muffin pan and cooked them for 20 minutes. 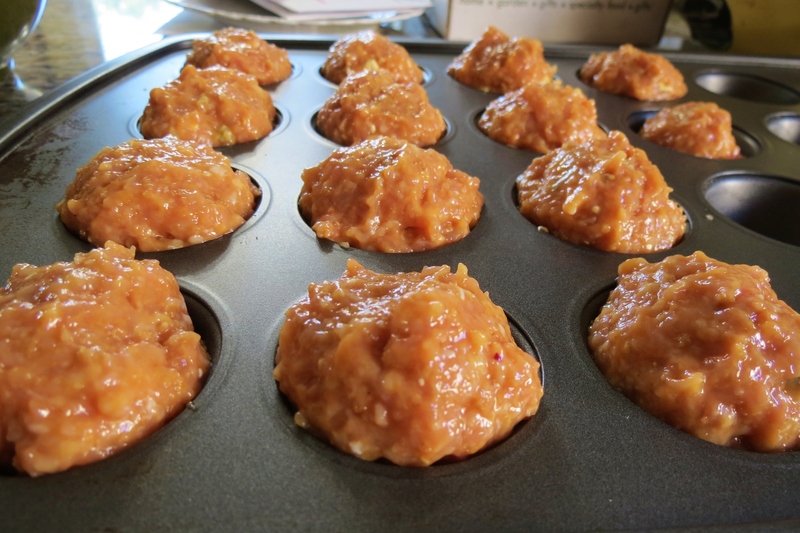 I love making my meatballs in a muffin pan. If there is any grease it goes to the bottom, there easy to take out and you get a perfect shape! Plus easy clean up. 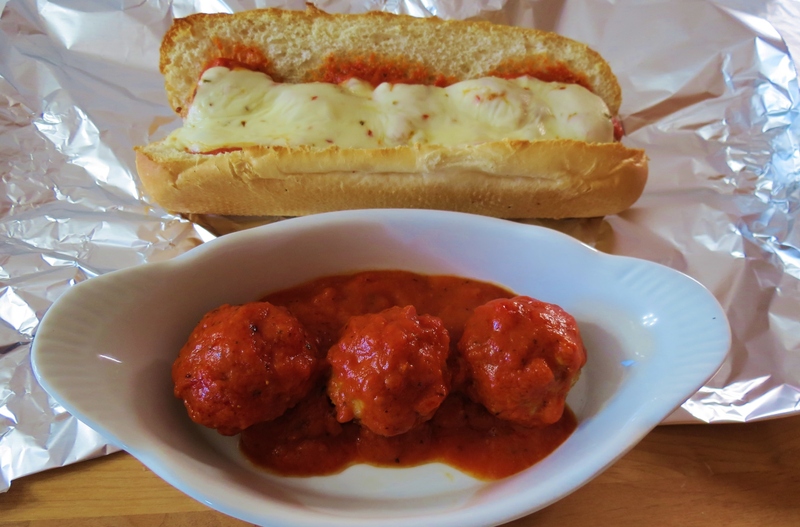 As I’m writing this post, I want another meatball. I guess I could pop one in my mouth. I only have 4 left. I was planning on freezing them, but that won’t be happening. Oh I wanted to show what they look like on the inside. See the little specs of blue cheese? A tender baked meatball made with ground chicken, wing sauce and blue cheese crumbles. In a large mixing bowl, combine ground beef, egg, wing sauce, bread crumbs and cheese. Using your hands, mix all ingredients until well combined. 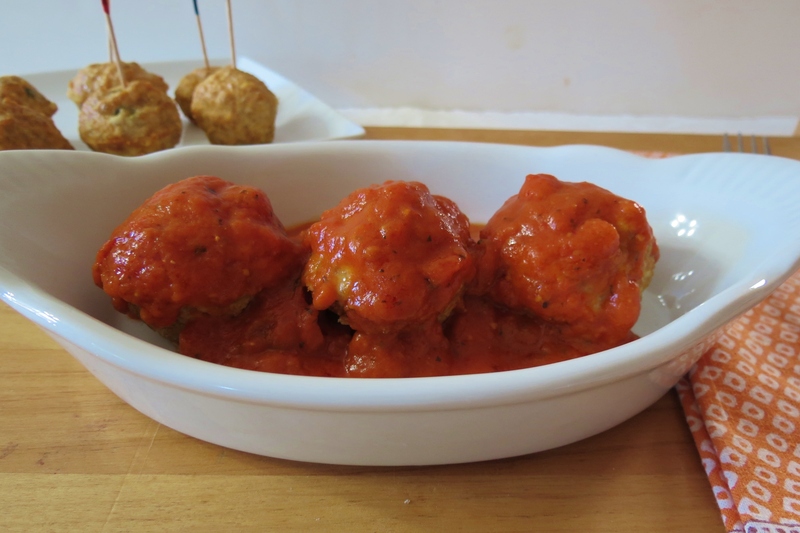 Using a food scale, weigh meatball mixture to 1.5-ounce portions (about the size of a golf ball). 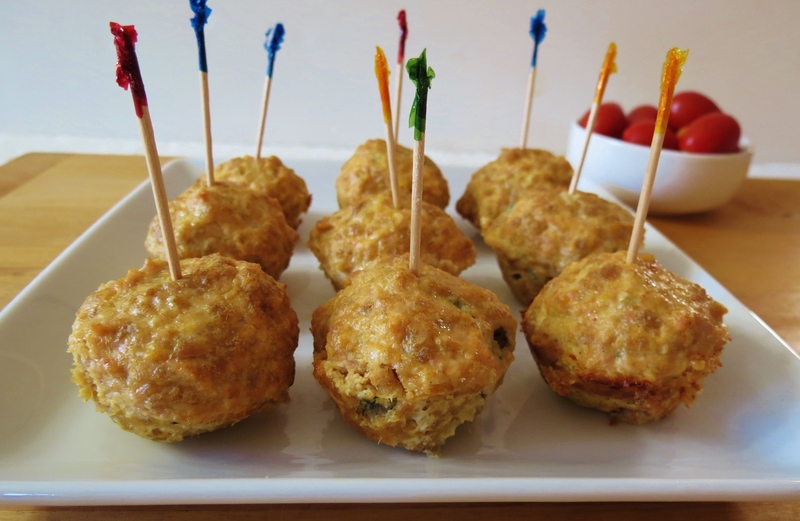 Roll into a ball and place each meatball into a mini muffin pan tin. Let them cool, Use immediately or freeze for future use. So how do you like your meatballs? As an appetizer? In a sandwich or covered with pasta sauce? I liked it in the sauce. If you haven’t tried Trader Joe’s 3 Cheese Pasta Sauce, you should, it’s pretty good!! This was the first time I tried it and we really liked it! 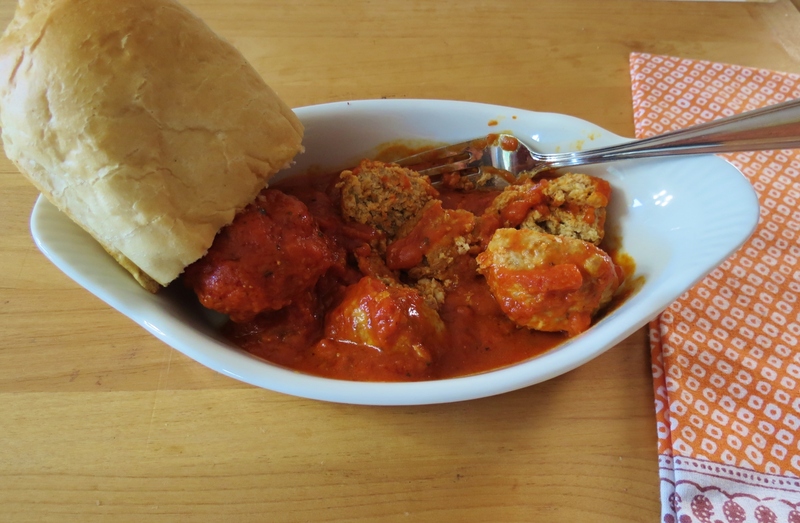 I”m thinking with my leftover meatballs I’m going to crumble it on a FlatOut bread and make a pizza with it!! Ohhh, can’t wait till dinner. Hubby, if you read this, it’s fend for yourself night! Well my Friends it’s late Friday night and I must be going to bed, I have to get up early tomorrow. Have a great weekend!! 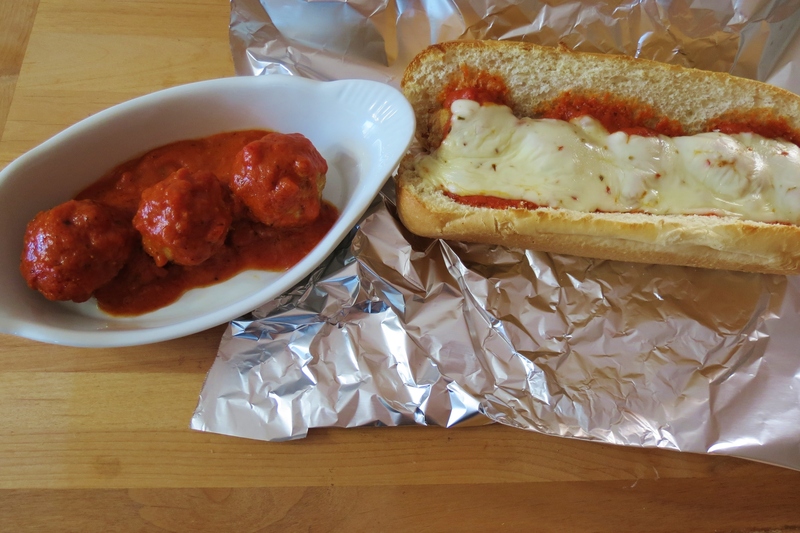 Hey, thought I would pop over to see what you are up to and there is your beautiful meatball sub. I just finished posting mine. LOL Great minds think alike. Hope you are having a great day!! I will definitely make these! My mouth is watering just at the thought of one bite! YUM! wow! can i come over now? these look insanely delicious! oooh! This would be a great alternative to wings :). I love it. Can’t wait to make them! Hmmm, maybe a shredded cheddar cheese will work? I don’t think that would taste to bad! !